These three First Communion downloads each cover the same audio Baltimore Catechism No. 1 material in different ways: audio, copywork, or booklet. To know, love, and serve God! These three Confirmation downloads each cover the same Baltimore Catechism No. 2 material in different ways: audio Baltimore Catechism, copy work, or booklet. Animals, seasons, patriotic, Easter, and Christmas coloring pages. Grouped in files for your convenience. There are over 450 pictures. The best St. Patrick book I've read! Beautiful pictures. 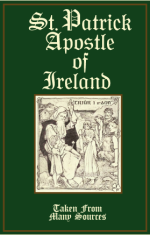 Includes Archbishop Healy's "Life and Writings of St. Patrick", "Legend of Saint Patrick - Confession of St Patrick" by Aubrey de Vere, as edited by Dr Whitley Stokes for the "Notre Dame" Series or Lives of the Saints. "Old stories retold!" Great history of Saint Patrick! "It is full of the Catholic Faith in God's power and Saint Patrick's power! I love this oft repeated line: "In this way God's name and Patrick's were once more magnified." (p. 11) 275 pages indexed. 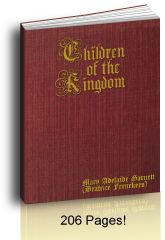 Really sweet saint book for children: Children Of The Kingdom, by Mary Adelaide Garnett (Fernekees) 1915, is a true Alphabet of Roman Catholic saints who were children, one of the sweetest children's books online! After Mary, Queen of all Saints and St. Joseph, the book covers boy saints and female saints for nearly each letter of the alphabet, A-Z. Forty-eight saints stories. You can read these from your eReader or print them and bind them since they are in pdf format! 206 pages. 10 or more CDs. Mix and match. Bookstores? Contact us. RCIA? God-children? Many Grandchildren? Contact us. Catholic homeschool curriculum? Several families? Contact us. Blog or website? See our Catholic affiliate program to sell our downloads for a 50% commission. Contact us for all of these. We're happy to hear from you! St. Anne's Helper Order page: audio Baltimore Catechism resources. Use PayPal (or debit and credit cards), 2CheckOut, or personal check: info at the bottom of this page. 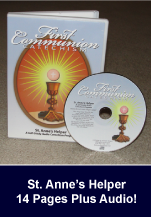 You can buy Saint Anne's Helper Audio Baltimore Catechism CDs And Catholic ebooks offline. Free Shipping on all CDs that we mail in the continental USA. Of course, no Shipping and Handling For Download. See instructions toward the bottom of this page for paying by check. Customer Service Hours: 9 am to 9 pm Central time, USA. Booksellers, Individuals, and Groups - $11.00 per CD, mix and match. Ten or more CDs receive free shipping for both booksellers and individuals. Consider forming a group with those around you. Consider those to whom you would like to give CDs as gifts of Faith. The downloads are simply the prices shown above with the product images with no shipping or handling. You may send a PayPal payment or a check. If you use PayPal, Contact Us to learn our PayPal email account. If you send a check, you will need to include the email address to which we should send the downloads. volume order discounts (ten or more). We also ship to booksellers free and can arrange to send your first orders directly to your customers if you send us the customer address. We will not approach your customers unless they sign up for our ezine, etc. 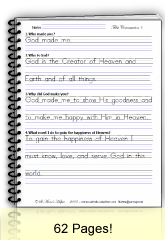 See more Catholic Homeschool products and recommendations here. Use E-Junkie for your digital delivery.